According to police: Read more. The Harvard Humanitarian Initiative announced today that Theresa Lund, its executive director, has been put on leave for her interaction with another resident of a Harvard-owned apartment complex - in which Lund wondered whether the woman, who has a biracial daughter, lived in one of the "affordable units" and demanding to know her apartment number in a dispute over how loud the woman's daughter was while drawing with chalk outside. Read more. The Cambridge Fire Department reports a two-alarm fire erupted shortly after 10 a.m. at Toscano, 52 Brattle St. Read more. Of course the signals go out in a sweltering Friday rush hour on the Red Line. A federal judge today dismissed a lawsuit by a woman who charged Harvard University failed to do enough to protect her from assaults and harassment by her ex-boyfriend and his pals while they were students there. Read more. 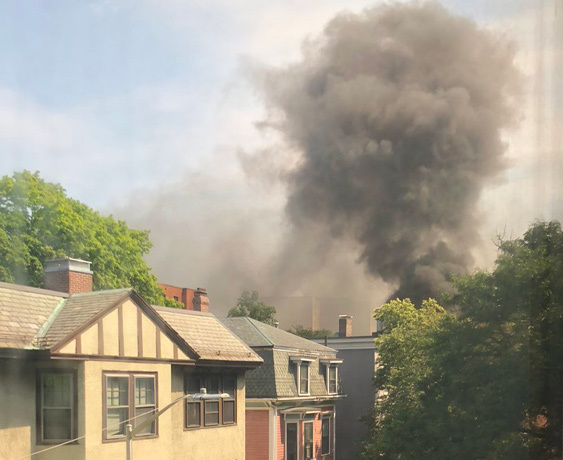 The MBTA is reporting various delays on the Red Line due to a train that expired at Harvard Square as well as some "ignited debris on the tracks." DJ Cuke Castle watched the firefighter and the flames around 9:30 a.m. 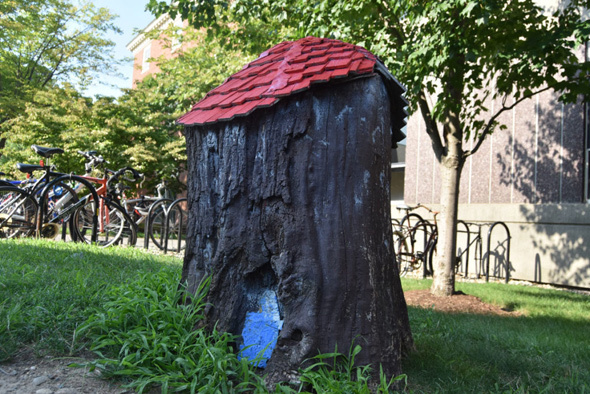 The Crimson reports Breaktime, exact Harvard Square-ish location still under wraps, will feature Union Square donuts and vocational and mentoring programs for workers. An Arizona man was arrested last night on charges he posted two comments on photos posted on Instagram by Harvard University last year in which he threatened to kill blacks planning a graduation ceremony at Harvard in May, 2017. Read more. Cambridge officials announced today the city has hired Roderick Ireland, retired chief justice of the state Supreme Judicial Court, to conduct an independent review of how Cambridge police officers arrested a 21-year-old Harvard student standing naked on a Massachusetts Avenue traffic island on April 13. Read more. The Crimson reports Harvard has barred Roland Fryer from his own on-campus think tank during the investigation. The Cambridge Historical Commission has been digitizing old photos, maps and documents, among them, this 1918 photo of the corner of Boylston Street (now JFK Street) and Mt. Auburn Street in Harvard Square, with this caption: Read more. Ray the roving UHub photographer spotted this tom peeping into a dorm room at Harvard (the Phillips Brooks House) today. The MBTA reports Red Line delays of up to 30 minutes because an inbound train is experiencing "a mechanical problem" approaching Harvard. 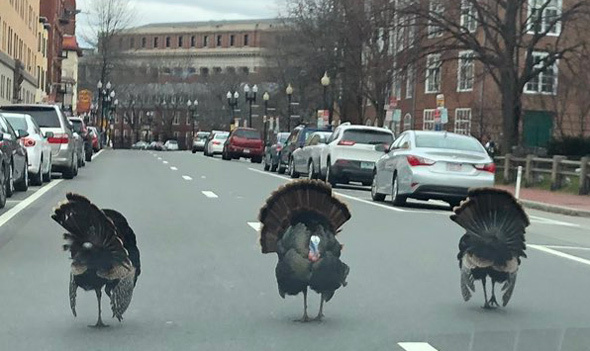 Chip Goines spotted this procession near Harvard Square today. Whole bunch of people lost a bet? We don't know! A Red Line train heading inbound breathed its last at Harvard Square at the height of rush hour, causing 30-minute delays. The carcass has finally been hauled away, but the MBTA reports there are still residual delays of 10 to 15 minutes. JP Shipley was boxed in this morning on Mass. Ave. in Harvard Square by a trio of turkey toughs, one of which turned to give a look that said "you wanna piece of me?"